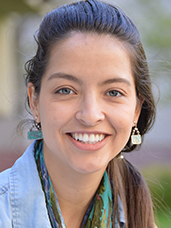 Jenna E. Gallegos, from the University of California, Davis, has been selected to represent ASPB as the 2017 ASPB/AAAS Mass Media Science & Engineering Fellow. She will spend 10 weeks this summer training as a science journalist at the Washington Post in Washington, D.C. In June, Jenna will earn her PhD in plant biology with a designated emphasis in biotechnology from UC Davis. For her dissertation, Jenna has worked with Dr. Alan B. Rose to investigate the mechanism by which certain introns increase gene expression even in the absence of proximal promoter sequences. While at UC Davis, Jenna was awarded an NSF graduate research fellowship and a dissertation year fellowship from the American Association of University Women. She also helped establish the UC Davis science communication and outreach group Science Says, which produces sharable content and organizes events to bridge the gap between scientists and the general public and address science myths in the media, especially on topics related to food and agricultural science. Jenna received a BA in molecular biology from the University of Colorado in Boulder. Given her very rural background, she is fascinated by the roles that molecular biology can play in agriculture. In navigating news about agricultural biotechnology, she quickly realized that misinformation on this and other topics of science and science policy abounds. To inspire a more scientifically literate public, Jenna blogs, makes videos, and shares digestible scientific news through social media. She is excited to reach a wider and more diverse audience as a science writing intern at the Washington Post this summer and sincerely thanks ASPB for affording her the opportunity.